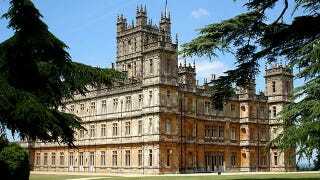 Highclere Castle, where Downton Abbey is filmed, has been home to the Carnarvon family since 1679. The 8th Earl of Carnavon and his wife live there now, but also allow the property to be opened to the public. One may explore the grounds, hold a banquet, or even use the manse as the backdrop for a wedding. But much like the television series, Highclere Castle has seen its share of scandal and turmoil. It once housed an eccentric abortionist. To boost her income, a new service was added to the menu at Alfred House [in London]. Though pregnancy termination remained illegal in Britain until 1967, a steady trickle of well-to-do female patients were now checking in to the nursing home. The consequence, had Almina been caught, would have been a jail term: instead high society looked the other way. The countess's nephew by marriage, Evelyn Waugh, described it as "Almina's abortionist parlour". Almina sounds like quite a character; she took a 40-year-old lover when she was 70 and died in 1969 at the age of 93 after choking on a piece of chicken. Be sure and check out the full piece at the link.